Contact us at (724) 733-2267 to learn more about our dog grooming services. Basic Bow Wow Bath - done by one of our Certified Camp Counselors. Add Daycare Services To Your Day At The Spa at this special price. 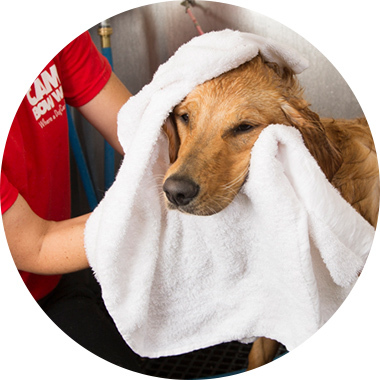 Our professional dog groomers will pamper your pup with: massage bath, hand blow dry and brush out, blueberry facial, ear cleaning, dremel nail trim & tooth brushing. Pricing may vary. Includes Day at the Spa services plus professional grooming cut and styling customized to your tastes. Price may vary. Colored nail caps. Lasts 4-6 weeks.